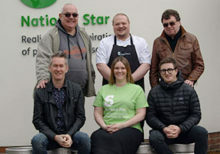 Now this year’s Cheltenham Beer Week, which will be held on 13 to 22 September, has again named National Star as its chosen charity. Last year National Star students designed the labels for the collaborative beers which were brewed at Cheltenham brewery DEYA in collaboration with other local breweries. ‘National Star does great work, helping young people with disabilities realise their potential as equal and active citizens in control of their lives,’ said Leigh Norwood, who is the chair of the Beer Week organising committee. ‘We have been part of the Cheltenham community for over 51 years, supporting some of the most vulnerable people in society, and their families,’ said Sally Gillespie, National Star’s Area Fundraiser for Cheltenham.